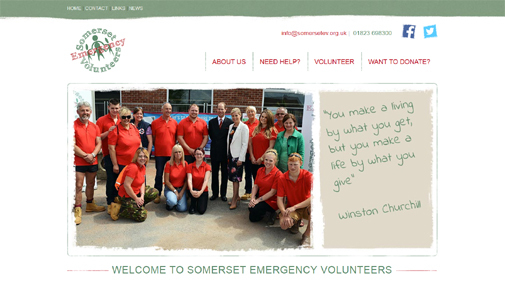 Somerset Emergency Volunteers came to Cosmic requiring a website for their new project. ""Somerset Emergency Volunteers is a joint project set up and managed by Mendip Community Support & South Somerset Association for Voluntary and Community Action following the flooding on the Somerset Levels in December 2013. The aim of the project is to manage and support volunteer activity to enable the volunteers to provide practical help to those affected by the floods. The Volunteers are here to offer help and support to the community from crisis, through recovery and into resilience offering a valuable service to the people of Somerset."" The SEV team required the ability to publish news to their website, as well as getting out the word about donating and fundraising. You can take a look at the Somerset Emergency Volunteers website by clicking here.